Vincent Willem van Gogh ( (March 30, 1853 – July 29, 1890) was a Dutch post-impressionist painter. Vincent van Gogh was born in the Netherlands in 1853. He had two brothers and three sisters. He was especially close to his younger brother, Theo. His father and grandfather were ministers, but some other family members worked in the art world. Vincent enjoyed drawing from the time he was a young boy, but wasn’t a full time artist until later in his life. He had many jobs in his life. He taught in London, he was a minister, he worked in a book store, he worked in an art gallery, and he was also a missionary. But at the age of 27, van Gogh decided to become a full time artist. Vincent van Gogh wrote often to his closest sibling, Theo. Theo worked in an art gallery in Paris and helped support Vincent's art career by sending him money and encouragement. Theo also tried help by selling Vincent's paintings. This was hard, because no one would buy them. Early on in his career, van Gogh used a lot of dark colors such as browns and dark greens. He sketched pictures using pencils or charcoal sticks, and occasionally some watercolors as well. His main subjects were poor, hardworking people and the paintings were usually serious and melancholy. His most famous early painting was called The Potato Eaters. It was a dark picture of a peasant family eating potatoes for dinner. 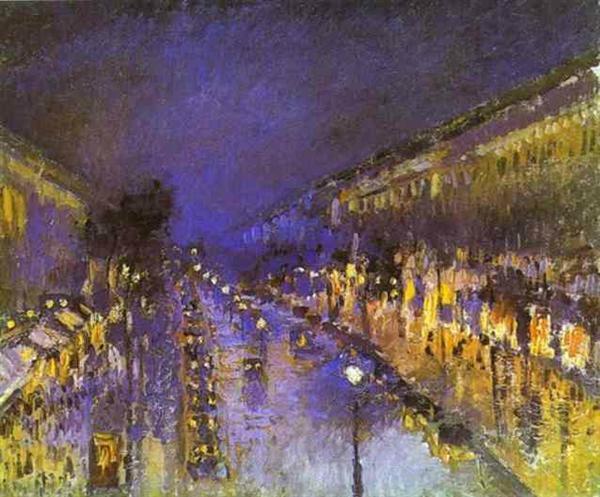 Around this time, he began to become interested in Impressionism. He moved to Paris to study this type of painting. The Impressionist artists wanted to capture a moment in time. Details were not as important – light and color of the moment were the focus. Working quickly to capture the light before it changed, they usually used quick brush strokes and unmixed color. Unusual visual angles and common everyday subjects were the norm. Some famous impressionist painters are Claude Monet, Edgar Degas, Camille Pissarro, and his friend, Paul Gauguin. He started to use more oil paints and brighter, more vibrant colors. Moving to sunny Arles, France with his friend, Paul Gaugin, reinvigorated his mind and his paintings became more joyful and intense. Sometimes he used so much paint, his painting would take weeks to dry! He soon became obsessed with art. He would paint non-stop and created hundreds of paintings during this time. Things weren’t perfect for long. After an argument with his friend, Paul Gauguin, van Gogh went home and cut off part of his left ear with a razor blade. He then wrapped up the ear in a cloth and presented it to a woman as a "present". Van Gogh was starting to deteriorate mentally. In 1889 van Gogh could barely take care of himself and committed himself to a mental hospital. It was during this time that he painted one of his most famous paintings Starry Night. Many of his paintings during this time featured cypress trees and lots of swirling colors. Sadly, on July 29, 1890 he died from a self-inflicted bullet wound to the chest. What do you think of his art? What is your favorite Van Gogh painting?